To describe St. Petersburg as in a state of chaos on the night of September 10th, 1917 would hardly differentiate the date from any other in the city’s post-Tsar existence. Already twice in 1917 had the capital appeared on the brink of revolution, successfully casting off Nicholas II in March and enduring a Bolshevik-inspired series of violent protests in July. In between, St. Petersburg/Petrograd had suffered from continued crippling deprivation and political dysfunction as the Provisional Government and elements of the various Soviets battled for control of the city and the country. But for the first time in ages, St. Petersburg’s chaos came with a sense of political unity, however temporary it might be. The latest threat to the capital wasn’t monarchists or Communists, but something far more terrifyingly tangible – a massive Russian army marching to end the political battles of the Soviets and Provisional Government by removing them both and placing the empire under a military dictatorship. Yet the narrative of the conservative and royalist Russian military attempting to crush the nation’s fledgling democracy would become only muddier as the days progressed. General Lavr Kornilov, the appointed Commander-in-Chief of the Russian army, claimed he was acting on orders from the Provisional Government’s Prime Minister Alexander Kerensky. The Bolsheviks and some members of the Soviets claimed Kerensky was orchestrating the entire affair to bolster his position, or was trying to remove the Soviets by force. Kerensky believed it was an international conspiracy to remove him due to his leadership role within the Petrograd Soviet and leftist leanings. It was a rorschach revolution – with all sides seeing what they wanted to believe – and a revolution Kerensky hoped to end on September 10th with a telegraph to Kornilov, dismissing him from his post with orders to return his army to their barracks. Kerensky believed he had put the issue to bed; Kornilov believed Kerensky had already been overthrown and that the telegraph had forged by revolutionaries. The stage appeared set for Russia’s third revolution in 1917. For an army that had experienced a near total collapse, Lavr Kornilov was a poor choice to lead it. The debacle of the Kerensky Offensive the previous July had led to a breakdown of the Eastern Front, with Central Powers forces advancing with little to no opposition. Aleksei Brusilov, the reformist general who had been exceptionally popular with his men, had been dismissed by Kerensky following Brusilov’s insistence on the return of capital punishment for disobedient soldiers. “Only the application of capital punishment will stop the decomposition of army and will save freedom and our homeland,” Brusilov implored Kerensky. Brusilov was hardly eager to crush the Soviets – in fact, he held a number of left-leaning sympathies that further isolated him within the army, on top of his half-Polish lineage – but the old cavalry hand knew that sometimes the riding crop had be used. For his blunt assessment, Brusilov was sent into retirement and his deputy, Kornilov, was appointed in his place. Kornilov had been a Russian war hero, successfully escaping from his imprisonment at the hands of the Austro-Hungarians in 1916. And for a man whose detractors would later claim was a royalist, Kornilov had played a small but key role in the February Revolution, placing the Tsarina and her children under house arrest while replacing the Tsar’s Imperial Guard with 300 revolutionaries instead. But if Brusilov was beloved by many of his men, Kornilov was, at best, begrudgingly respected as a rigid disciplinarian. Immediately following his appointment as the Commander-in-Chief of the Russian army, Kornilov demanded the right to exact capital punishment. Kerensky, unwilling to dismiss yet another general, this time yielded his opposition. The executions would continue until morale improved. For the more conservative elements of Russian society – both in the army and in the private sector – the events following the February Revolution had been a waking nightmare of revolutionary fervor. While the Provisional Government was criticized by it’s far-left opposition as weak and ineffective, the government had passed a series of sweeping legislative changes to Russian society in a matter of months. Increased local autonomy, both at the regional and city level, as well as and the affirmation of fundamental civil rights (such as freedom of speech, press, and assembly), were changes than most of Russian society, perhaps save the aristocrats, could generally get behind. But land reform, the confiscation of property and an anti-capitalist political bent were terrifying to what remained of Russia’s wealthiest citizens. In many cases, peasants and workers were now seizing farm lands and factories by force, with the Provisional Government either unwilling or unable to stop it. The drastic nature of the changes were easily signified by the fact that the Constitutional Democrats, known as the Cadets, had been represented the extremist left-wing in the Tsar-era Duma. The Cadets were now snidely referred to as the “conservatives” by the Soviets. Hated at home, the Provisional Government was distrusted abroad. The Western Allies saw harbingers of the February Revolution within the ranks of their own armies, and coupled with the potential of Russia leaving the war entirely, London and Paris were unsure whether the Provisional Government needed to be supported or contained. In the end, the socialist sympathies of Alexander Kerensky seemed a price worth bearing in exchange for keeping the Russians in the war and the “foul baboonery” of Bolshevism (Winston Churchill’s eventual words on the movement) out of power. For Kornilov, the Provisional Government had already become too compromised by its association with the Soviets. At a State Conference in August, Kornilov outlined an aggressive proposal to Kerensky to rein in the Soviets through military force. The details of the private meeting would be lost to history, but both Kerensky and Kornilov agreed that Kerensky said “as long as the Bolsheviks are sitting in the Smolny [the building where the Soviet Congress was now meeting], nothing can be done.” Kerensky believed his remark had ended Kornilov’s plan; Kornilov believed the remark meant he was suppose to shutdown the Soviets first. Both proceeded as though they had gained the other’s support. Kornilov immediately went to work building support for his invasion of St. Petersburg. Meeting with a series of wealthy Russians, Kornilov told them Kerensky had approved the operation but that it needed funds to be successful. 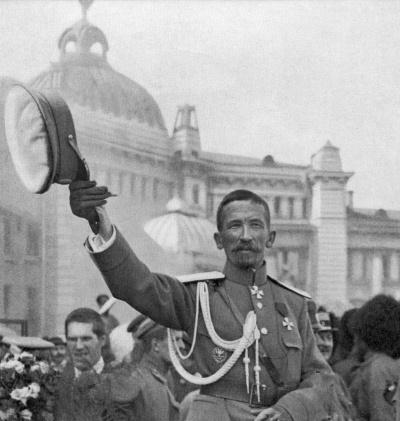 Kornilov’s men would enter St. Petersburg, arrest the remaining Bolsheviks who weren’t already in jail, disband the Soviet, and then install a new constitutional assembly under Kerensky’s authority. The concept received a warm welcome. British authorities were equally interested in supporting Kornilov’s coup. Britain’s military attaché, Brigadier-General Alfred Knox, backed the endeavor, with War Council member, and future British Secretary of War Lord Alfred Milner, also writing Kornilov with his approval of the operation. Kerensky would spend the decades after the Russian Revolution insisting that Winston Churchill had orchestrated the Kornilov Affair, albeit with no evidence. Kerensky could lob barbs with the best of them, but he was hopelessly outgunned in any exchange of actual ammunition against Kornilov’s army. The absolute weakness of the Provisional Government had been laid bare – despite all the trappings of power, and the oratory might of Alexander Kerensky, the Provisional Government couldn’t even muster the authority or military strength to stop their own Commander-in-Chief. Thus, as they had repeatedly since the fall of the Tsar, the Provisional Government turned to the real power in Russia – the Soviet. The Soviet wasn’t going to fight to save Kerensky, but would fight to save the revolution, if Kerensky gave in to their demands. The very Bolshevik leaders who had been arrested in July were now freed. 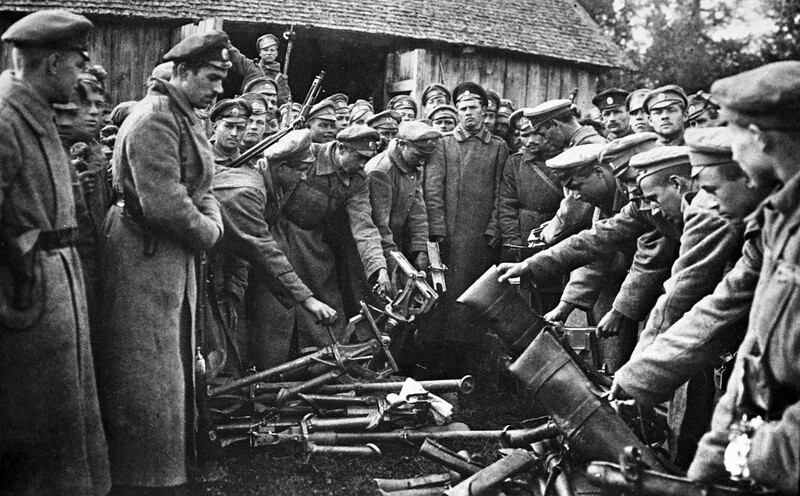 The Bolshevik Red Guards, the group’s militia, who Kerensky eyed warily were made de facto government forces and given arms as their force swelled to 100,000 men. The entire resistance of the city was outsourced to the Soviet, and the Soviet was quickly becoming dominated by the Bolsheviks. To save itself, the Provisional Government authorized it’s own eventual execution. The Soviet’s control of the rail and communication lines slowed the advance of Kornilov’s army. Soviet sympathizers within the 3rd Army Corps began encouraging soldiers to defect or simply desert. Thousands abandoned the march and Kornilov’s ranks thinned with each passing hour. Those who had supported Kornilov’s invasion also began to leave once it became clear that Kerensky had not been overthrown by the Bolsheviks and was not in support of Kornilov’s actions. Kornilov had literally become a general without an army, and by September 13th, his march faded away, having never reached St. Petersburg. The general was thrown into prison, with Kerensky vainly attempting to exert his influence in the face of disaster, much as he had done following his failed offensive in July. The Prime Minister hoped to claim the victory that had preserved Russian democracy; instead he was lambasted as the leader who couldn’t stop his own general from trying to overthrown him. What become known as the “Kornilov Affair” would be remembered differently by each faction in Russia. With few details in writing, and the accounts of Kornilov and Kerensky widely differing, the incident would lead to an assortment of conspiracy theories. The only key point all parties could agree upon was that the Affair had been the final nail in the coffin of the Provisional Government. All that remained was it’s final burial at the hands of the Bolsheviks the following month.